Doctor Who anniversary special, Day of the Doctor, and special guests. The Doctor Who 50th Anniversary Special Brought Back Doctor Who Who? 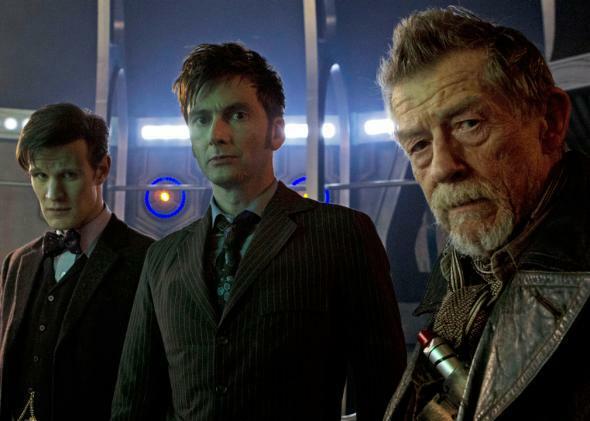 Matt Smith, David Tennant, and John Hurt as Doctors Who. My take? I think “The Day of the Doctor” is a triumph, displaying the best use of Moffat’s techniques (other fans would call them “tricks”; like I said, contentious) in the service of a substantive inquiry into the nature of the Doctor, and how hard experience can bend a person toward good or evil. It was witty, heartfelt, forward-looking, and crazy-in-love with the universe of Doctor Who. But sure, of course I had some nitpicks. I’m a fan, aren’t I?